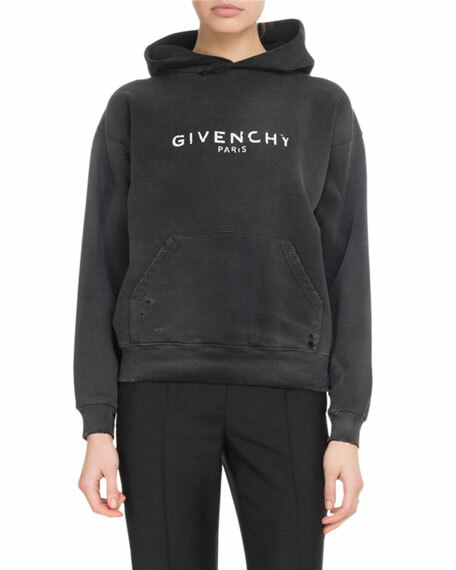 Givenchy destroyed sweatshirt with Givenchy Paris logo. Givenchy sweatshirt with beaded, embroidered 4G logo. Crew neckline. Long sleeves. Semi fitted. Pullover style. Ribbed hem and cuffs. Cotton. Givenchy sweatshirt with beaded, embroidered 4G logo. Crew neckline. Long sleeves. Semi fitted. Pullover style. Ribbed hem and cuffs. Cotton. Made in Italy.